Amazing photos of royal tours throughout the years! How many British royal tours do you remember? From the faux-pax made by the Lord Mayor when the Queen visited Sydney in 1954, to Kate and Prince William’s matching cowboy hats in Canada, we look back at the royal tours of the past to the present. 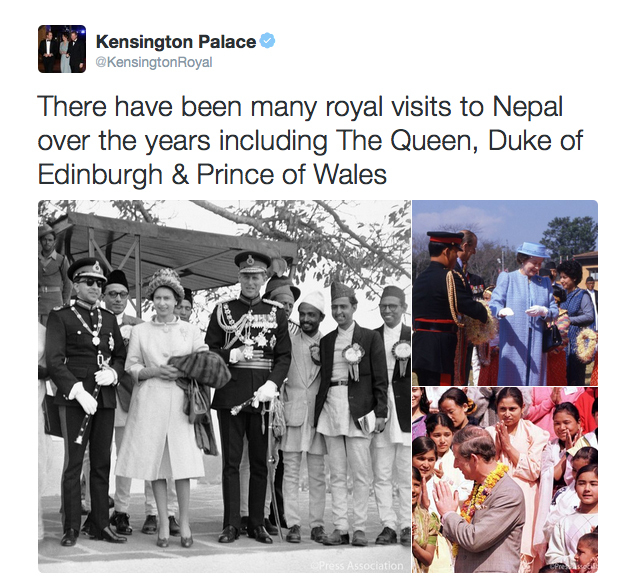 There are many exciting royal tours planned for this year, with the Duke and Duchess of Cambridge due to follow in Prince William’s parent’s footsteps and visit India, and Prince Harry set to travel to Nepal in the Spring. Will Prince William and Kate be taking their children, Prince George and little Princess Charlotte, on their royal tours with them to India and Bhutan this spring? Watch this space to find out, and check in with us on Facebook! From Queen Elizabeth’s fabulous jet-set fashion, to adorable Prince George’s little facial expressions stealing the show in every holiday snap, and Prince Harry’s remarkable charity work in South Africa – take a look back at these throwback photos of some of the best moments from the royal tours around the world. The Queen is given a ride on a fantastically decorated elephant to the Balua Ghat In Banaras. The Queen is carried through a jungle near Katmandu on an elephant. Sitting Japanese-style on a Tatami mat floor The Queen practises using chopsticks at a Japanese restaurant In Kyoto. Prince William arriving at The supreme Court in Wellington. Prince Harry visit the Queen Elizabeth II Children’s Hospital in Bridgetown, Barbados. Prince Harry teases Prince William with a snake whilst visiting The Mokolodi Nature Reserve in Botswana. Prince William and Catherine Duchess of Cambridge get into the swing of things at a Government of Canada reception at the BMO centre for the Calgary Stampede. Prince William visits The University of the South Pacific. Prince William and the Duchess of Cambridge go on their first royal tour with their new addition to the royal family – Prince George! Little George steals the spotlight when Prince William and the Duchess of Cambridge visit Taronga Zoo in Sydney. They view a Bilby and officially name the Prince George Bilby Exhibit! Prince Harry at ‘Surfers Not Street Children’ project in Durban.